This past weekend, traveling through the North Georgia mountains, I found these beautiful, perfectly ripe tomatoes in Helen, Georgia. 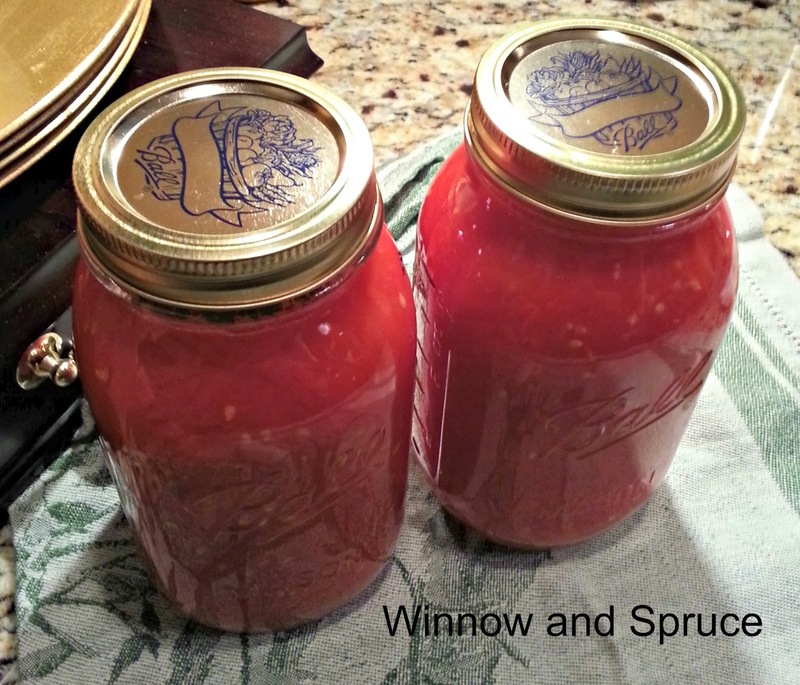 I thought tomatoes were gone by now and I'd missed my chance to do some canning. I couldn't resist buying a box of them. 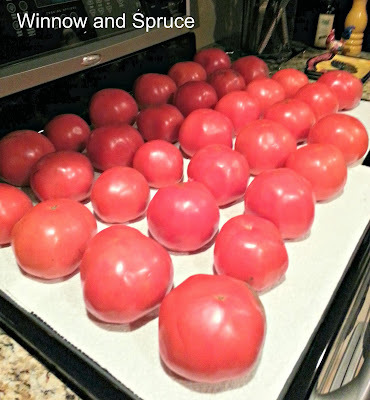 This box of tomatoes weighed 25 pounds. That's enough for 8-10 quarts of canned tomatoes if I don't eat too many first. I spread them on paper in a cool place. I don't want them touching so the air can circulate. Every day I check to see which tomatoes are ready for canning. To me, that means red all the way down to the stem with no yellow or green left showing. Rinse off the tomatoes you're ready to can. 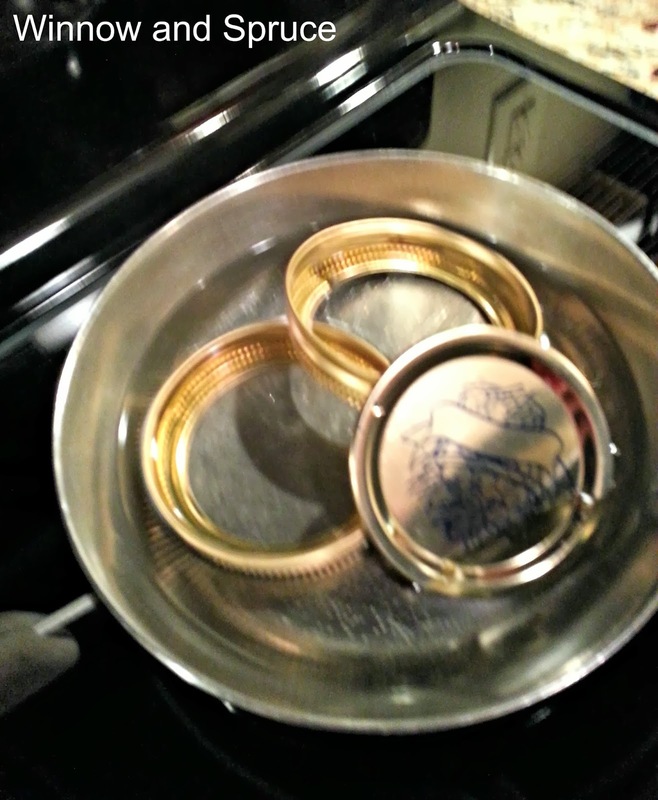 Then I put them in the sink for a hot water bath. Bring water to a boil and pour over the washed tomatoes. 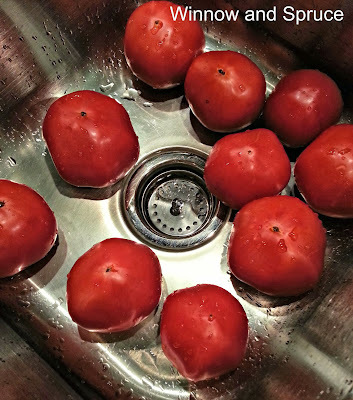 Let stand for approximately 20-30 seconds, turning tomatoes over several times. 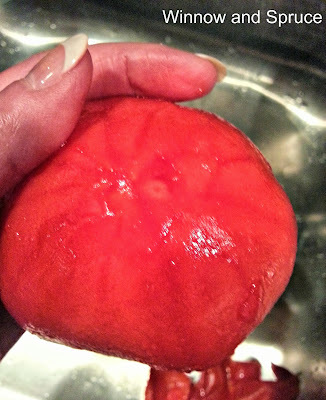 The longer you leave them in the hot water the more "tomato" will come off with the peel. 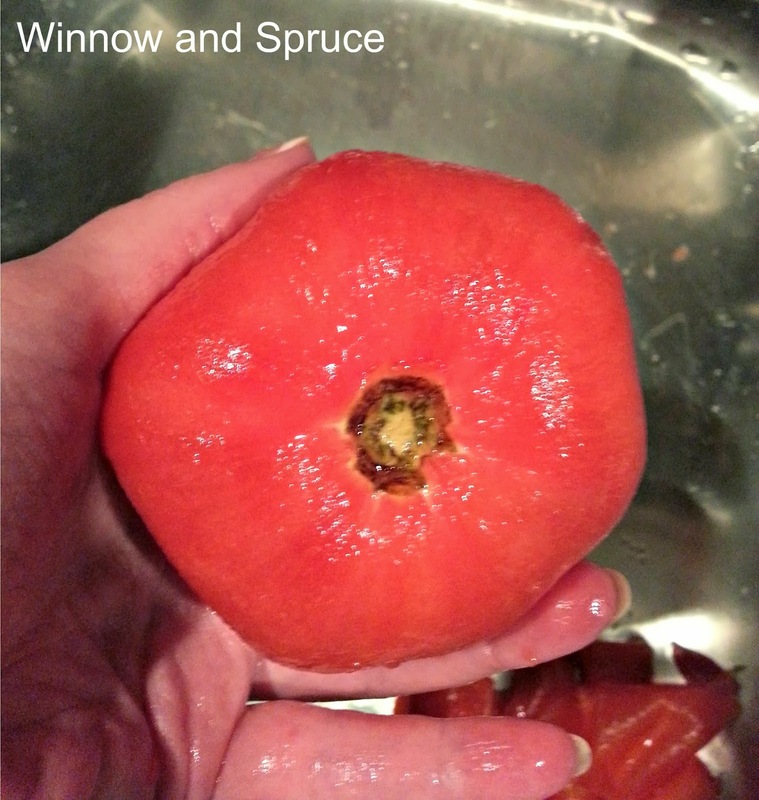 You want them in the water long enough to loosen the peeling without beginning to cook the tomato underneath. 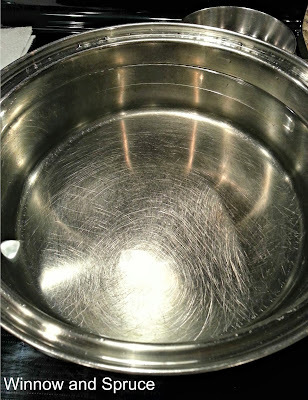 I let the water out when I think they're ready. 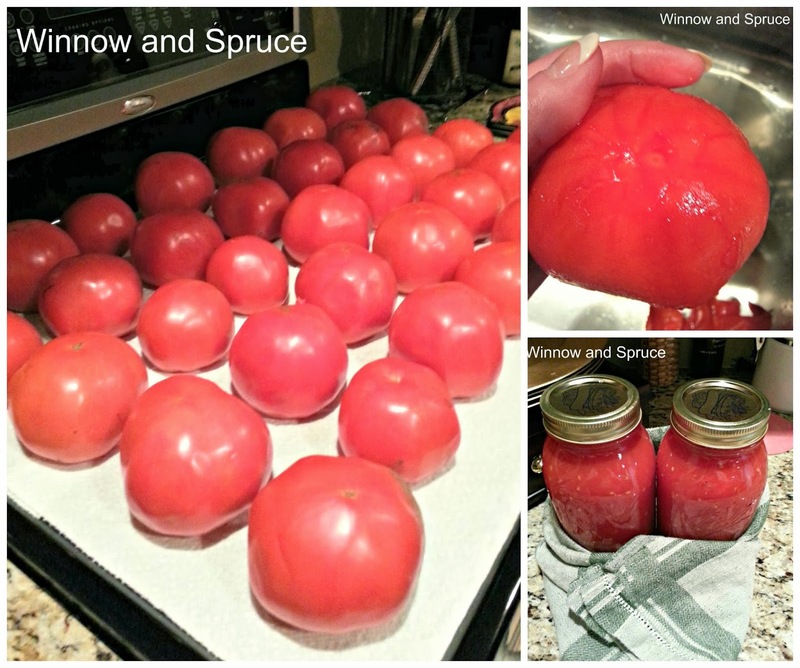 It's amazing how quickly you can peel a batch of tomatoes. 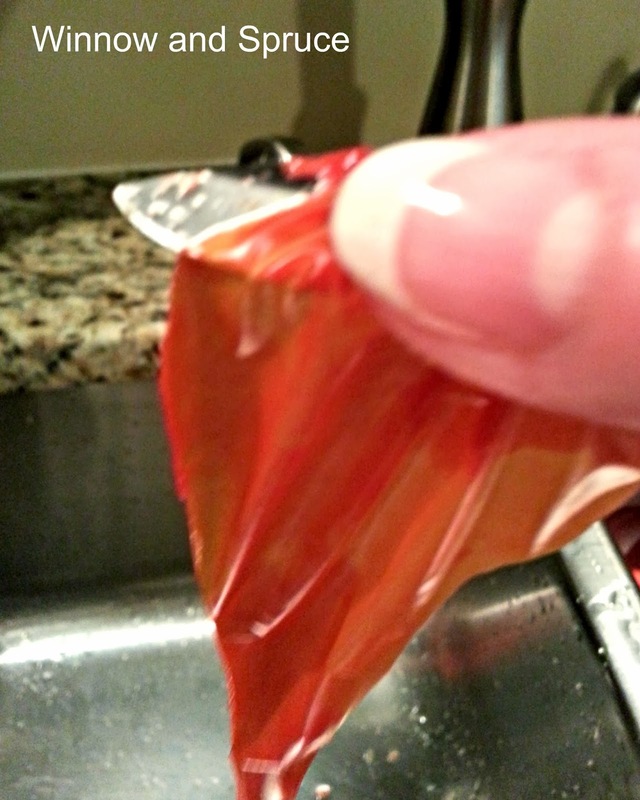 The peel comes off in sheets. 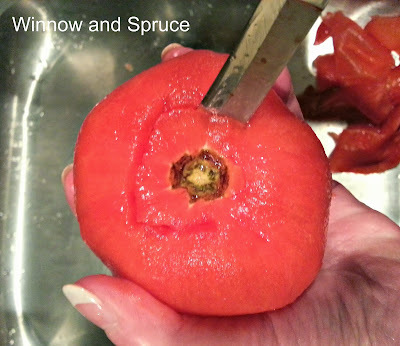 Core the tomato with a small paring knife. 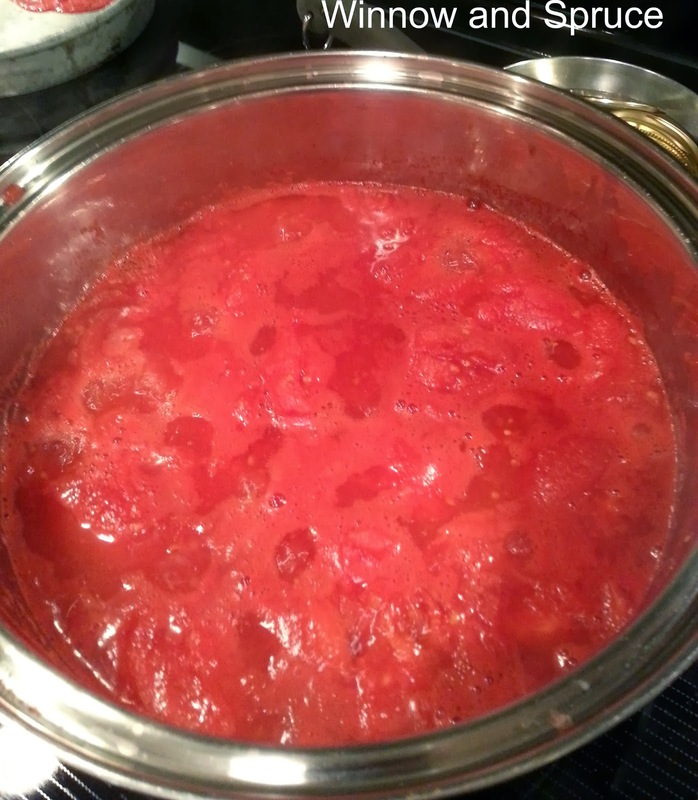 I always smell the tomato to make sure it's not going bad. Believe me, you'll know if it is. Warm beyond-their-peak tomatoes smell unpleasant. Make sure you don't include a bad tomato in your batch. I quarter and squeeze a couple to release a little juice into the pot. This keeps them from scorching when first heating up. Bring the tomatoes to a boil, stirring occasionally to keep from sticking. A "foam" will begin to form on the surface. 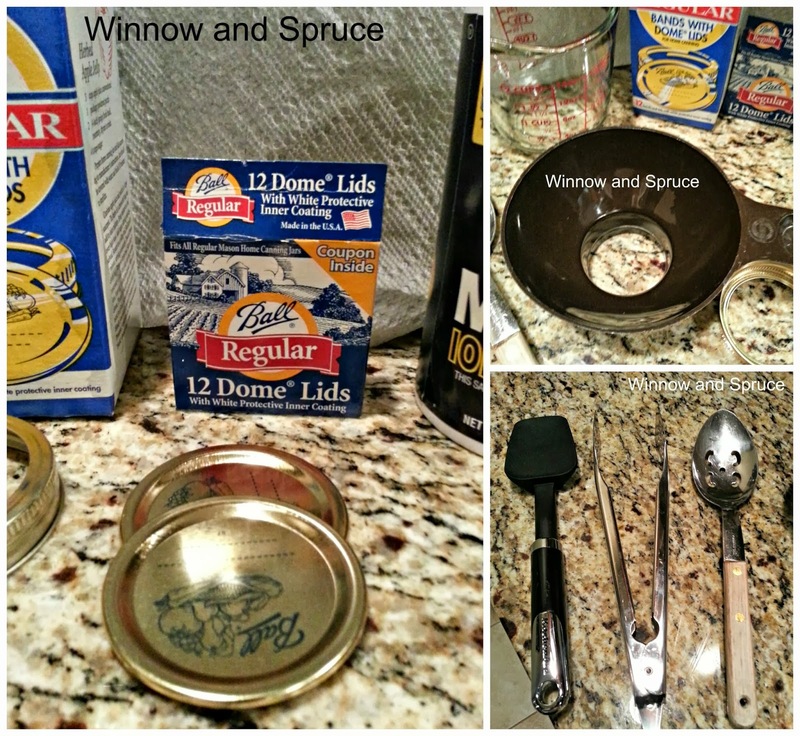 Skim it off with a metal spoon and discard. Continue until you have removed as much as possible. A little foam won't hurt anything. 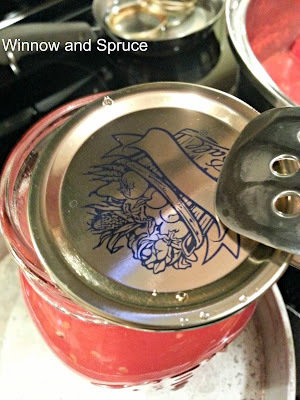 Wash your canning jars, lids and rings. Heat the metal top assembly. They need to be hot when placed on the filled jars. 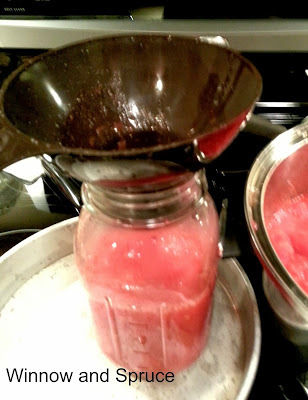 I found a canning funnel several years ago and it makes filling the jars so much easier. I use a glass measuring cup to pour tomatoes in the jars. 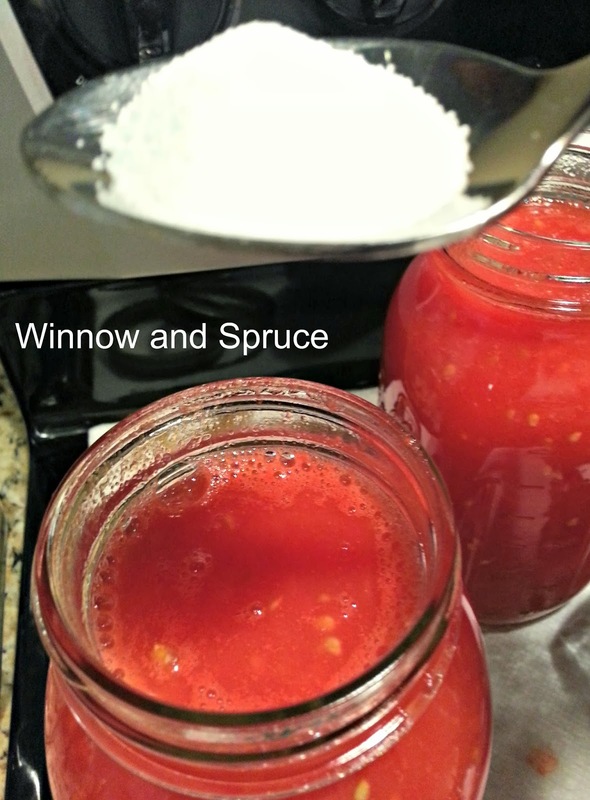 I add less than 1 tsp. of salt to each filled jar. The angle of this picture makes it look like more but it's not. Lightly stir it in. It's really nothing more than rinsing the spoon off. Wipe the rim with a damp cloth or paper towel. 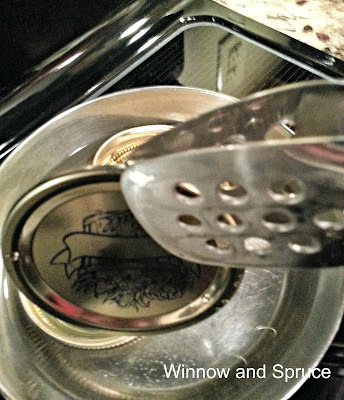 The lids won't seal properly unless the rims are clean. Place the lids on the jars. Then the rings. Tighten. I tighten them by hand, but do use a rubber jar opener to get a good grip. Now they're ready to be covered and allowed to rest out of a draft until they seal. Place the jars close together. 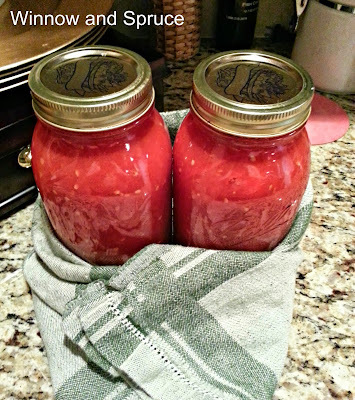 I use a couple of folded dish towels on top of the jars for a small batch like this. I''ll use several bath towels when canning a couple dozen jars at a time. 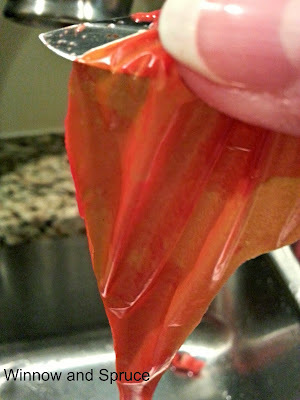 You'll hear them "pop" or "ping" over several hours as the lids vacuum seal themselves. Tomatoes are very acidic and don't require boiling the filled jars in a pressure cooker or water bath to ensure a good seal. Other vegetables, green beans, for example, require 20 pounds of pressure for 20 minutes in a pressure cooker to seal. Sometimes, tomatoes can go bad if there's a chip in the rim of the jar or a bad lid. Be sure you check them after they're sealed, after a couple of days, and again in a week or two. 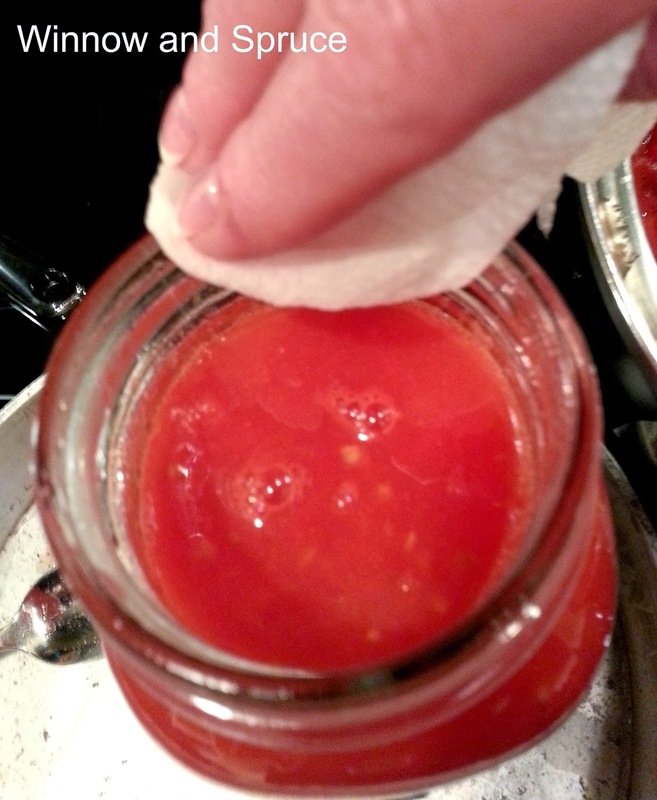 Make sure the lid is still "depressed" and no discoloration is showing inside the top of the jar. 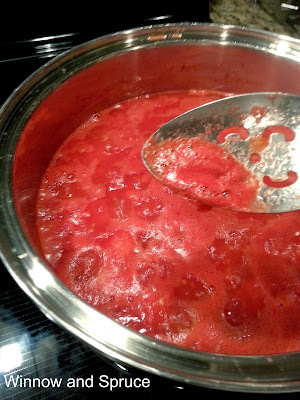 Home canned tomatoes make the best spaghetti sauce, chili, lasagna, or whatever else you use store bought tomatoes for, you've ever eaten. Nothing... nothing... beats fresh produce prepared at its peak. So, I'm curious... have you ever canned tomatoes? 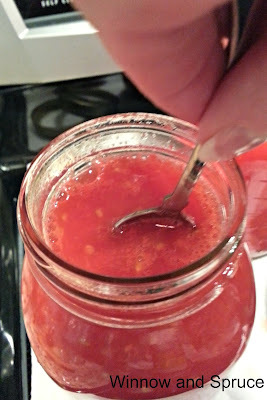 Made jams, jellies, pickles, relishes? I'd love to hear about it... so please consider sharing. 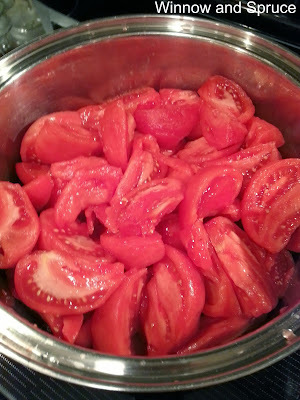 Thank you for sharing How To can tomatoes at home with Foodie Friends Friday party this weekend. 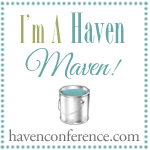 I'll pin and share this weekend. We look forward to seeing you again soon with another terrific post.